Now and then I have the opportunity to test new equipment for astrophotography. That can be both a blessing and a curse — I get to try out new gear before I buy it to see if it really works first, which is nice. But if the equipment doesn’t work well, I might have wasted some valuable nights with little to show for it but some poor photos and lots of frustration. Not so with the gear pictured here. The Celestron CGEM mount, tested for SkyNews magazine, worked great, tracking very well and serving as the platform I used in late 2010 for a lot of astrophotos over two dark of the Moon periods. At about $1500 this is a superb entry-level mount for anyone serious about astrophotography. I also can praise the Celestron NexGuide autoguider (with the glowing screen at right), shown here on a William Optics 66mm guidescope. It, and its near twin, the Synta SynGuider, worked very well — these are autoguiders to provide exact tracking of the mount over long exposures, a necessity even in the digital age. Unlike many autoguiders, these units are “stand-alone,” requiring no additional computer and able to run for many nights off a typical 12-volt power pack. They are great for use in the field. What’s more, the new autoguiders are quite low cost (~$300) compared to the $1000+ cost of previous models with similar capabilities. I reviewed these units for Sky and Telescope and for SkyNews. The scope shown here is a favourite of mine, the A&M (now Officina Stellare) 105mm f/6 apo refractor, a beautiful Italian-made “designer scope” with first-class optics. It is a terrific visual and imaging telescope, though a little large for its aperture. 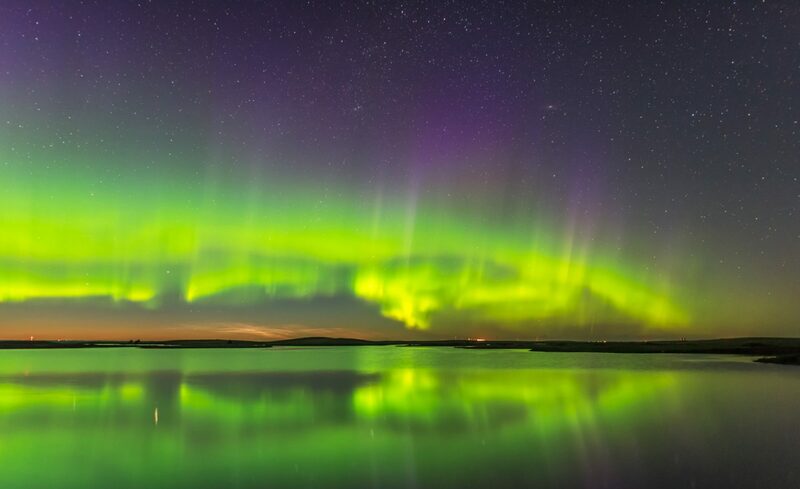 For more details about recommended autoguiders, see the website I developed to support The Backyard Astronomer’s Guide and follow the links to the Chapter 13 entries on astrophoto gear. It sits not far away in the deep southern sky from its larger counterpart, but it must feel rather inferior and sadly neglected. Pity as this object does have lots to offer. 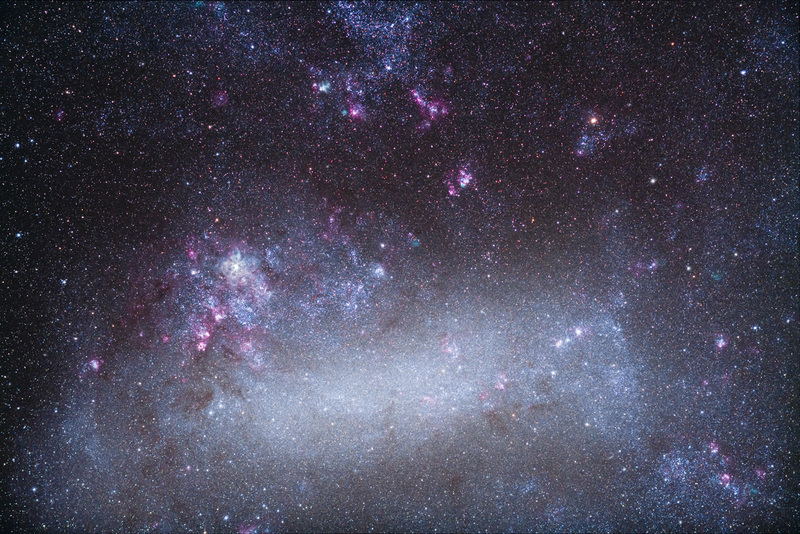 This is the Small Magellanic Cloud, a satellite galaxy to the Milky Way and a companion to the Large Magellanic Cloud — each is named for Ferdinand Magellan who noted them on his pioneering circumnavigation voyage of the world in the 16th century. The Small Cloud doesn’t contain the number and complexity of nebulas and clusters as does its larger brother, but it does have some lovely offerings, like the complex of cyan-coloured nebulas and related clusters at top. However, the notable sights in this area of sky aren’t actually part of the SMC. 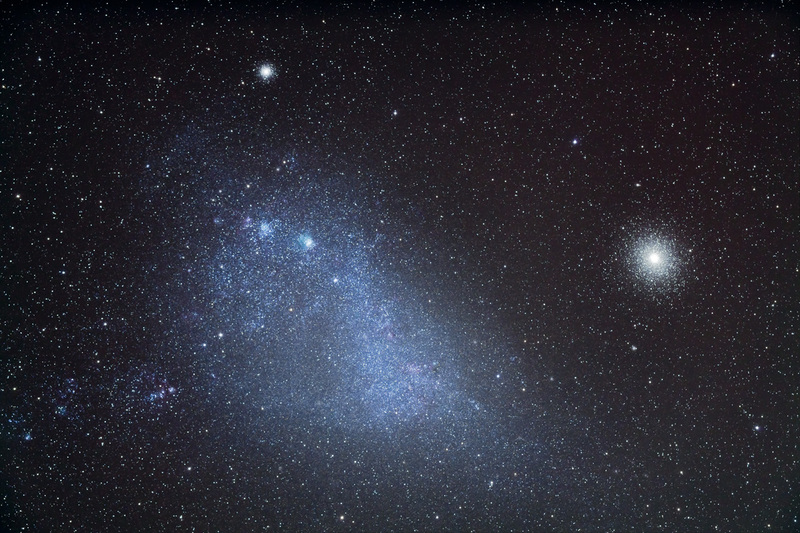 The two globular clusters in the field lie much closer to us. NGC 362 is a nice globular at top, but it pales in comparison (every such object does) next to the amazing object known as 47 Tucanae, or NGC 104, the huge globular cluster at right. It is a wonderful sight in any telescope. This is a stack of five 7-minute exposures with the Borg 77mm f/4 astrograph and Canon 5D MkII at ISO 800. I took this on my astrophoto trip to Australia in December 2010, a season when this object is ideally placed for viewing. Most times of the year, the SMC is dragging close to the horizon and lost in the murk, as least for shooting. That’s another reason the poor old SMC gets no respect! I like shooting in Australia as I have the good fortune of having family there who kindly allow me to store equipment down under. On each trip over the last decade or so, I’ve brought down various bits of gear, not to mention clothing and other necessities, to be left on site for the next shooting expedition. Now, when I go, I just have to take camera gear, a computer & gadgets, and a couple of days clothing. All else is already there: an Astro-Physics 400 mount, an AP Traveler 105mm apo refractor, a 10-inch compact Dobsonian reflector, and all kinds of accessories, eyepieces, power supplies, adapters, etc. etc. The gear fills several watertight and dust proof storage bins as well as a large golf case brought down originally in 2002. Each trip usually means taking a new autoguider system as well, since the technology changes so much from trip to trip. 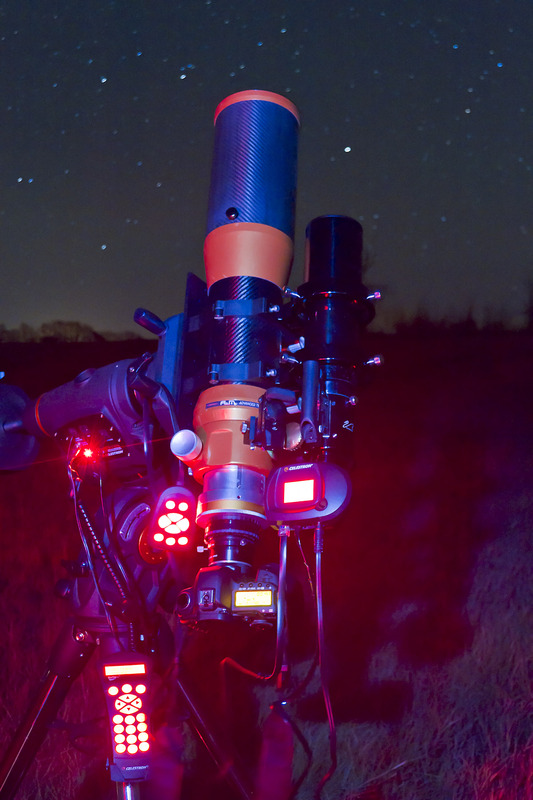 In December 2010 I brought two systems, the Santa Barbara Instruments SG-4, shown here, with its e-finder lens, and the Orion Starshoot with a small Borg 50mm guidescope, as a back up just in case the stand-alone SG-4 did not work in the southern hemisphere on a mount it had not been calibrated on and had never “seen” before. I needn’t of worried – the SG-4 worked beautifully — perfectly guided shots with a push of a button. Stunning! But it is an item I have to take back and forth — like the cameras, it’s all a little too costly to have multiple copies in both the northern and southern hemispheres, at least vs. the size and weight involved in packing and carrying them. With mounts and scopes there is no question — yes, they are costly but there is no way I’m hauling all that gear back and forth for every trip. So at home, I have other mounts and scopes to take the role of the wonderful AP gear that has emigrated to Oz. 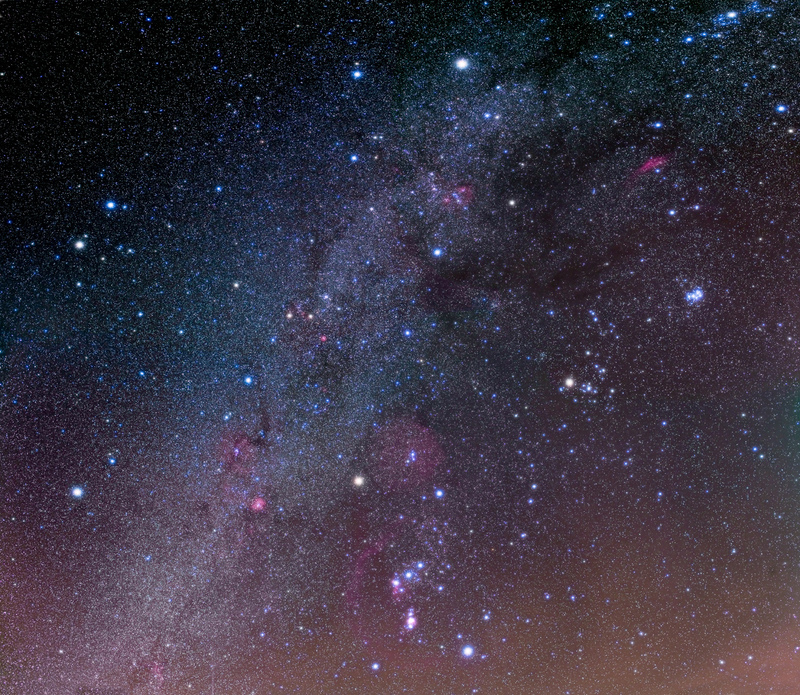 An area of sky often neglected but ideal for digital imaging is the region of Milky Way in Taurus and Auriga. Threaded through this area of sky are large lanes of dark interstellar dust, forming cold molecular clouds out of which stars form. This complex is close, only 400 light years away, in our spiral arm of the Galaxy, and so is spread out over a wide area of sky. Only piggybacked cameras with normal and wide-angle lenses capture it. But today’s digital cameras are able to record these kinds of dark nebulae as more than just dark holes in the sky — they have colour, usually shades of reddish-brown. This is a shot from January 2011 from my home backyard, and takes in all of Taurus, most of Auriga and southern Perseus, with the Pleiades at right and the Hyades below. 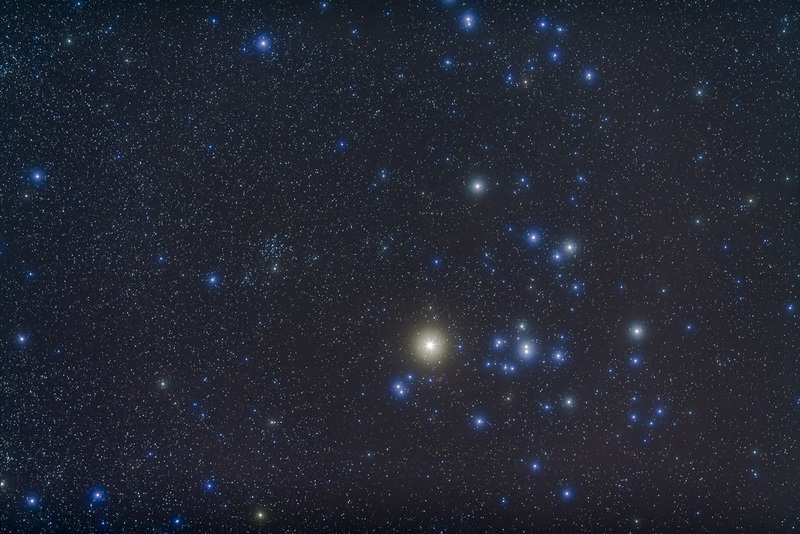 Here’s a photogenic rendering of a classic northern winter sky object, the Hyades star cluster in Taurus. The Kenko Softon filter added the star glows and punched out the subtle colour variations in the stars. Note how the Hyades stars come in shades of blue and white. The yellow star is Aldebaran, the eye of Taurus the Bull and an interloper here — Aldebaran is actually halfway between us and the Hyades, which lie about 150 light years away, and are true cluster of stars moving together through space. 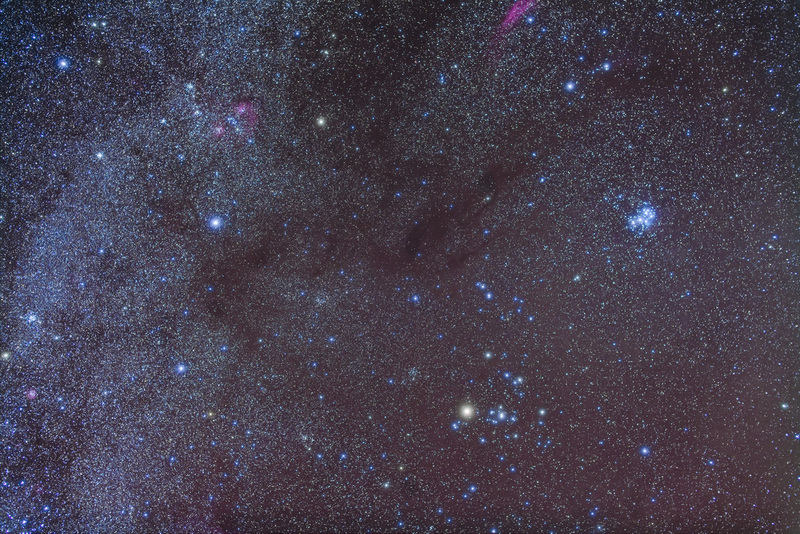 Note the much more distant and smaller star cluster, NGC 1647, at left.